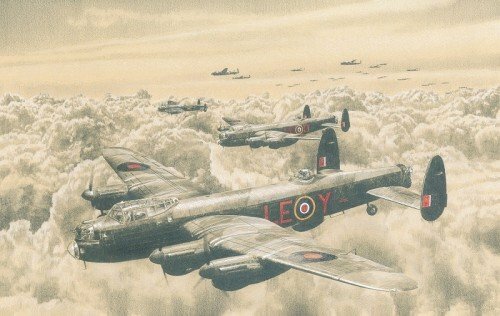 A strong force of Lancasters from 630 and 57 Squadrons, based at RAF East Kirkby, head out to attack industrial targets in the Ruhr, Autumn 1944. Few aviation artists come close to Richard’s extraordinary skill with pencil and paint which is why his drawings are so highly prized. This outstanding piece is completed in his trademark technique combining graphite with colour highlights on buff paper. A total of 212 Operations were undertaken from RAF East Kirkby between August 1943 and the end of WWII, all of which were flown by 630 and 57 Squadrons. It is of great historical importance that every print is personally signed by one of the last surviving veterans that flew combat missions from East Kirkby during WWII. Flight Lieutenant ‘STEVIE’ STEVENS DFC AE Joined 57 Sqn as a Pilot in May 1943 and completed a full tour of 30 Operations including raids over Dortmund, Hamburg and Italy. THE REMARQUE EDITIONS Richard's original pencil remarques are quite simply outstanding and collectors have the opportunity to acquire one of his remarkable remarques with subtle colour highlights. Each print in the remarque editions will have an original pencil drawing, hand-crafted to order by the artist in the lower margin below the image. With fifteen Single Remarques and just TEN Double Remarques issued they are likely to be in great demand. This edition is a follow up to Richard’s hugely popular earlier pieces COMING HOME TO KIRKBY and RETURN TO EAST KIRKBY. A very limited number are available and matching numbers can be supplied whilst stocks allow.